Two weeks from today, many fans will be sitting in their local theater, watching Star Wars: The Force Awakens on opening night. Even with a slew of new details that have surfaced in the coming weeks, the film's biggest secrets still remain intact, amid countless unconfirmed rumors that have surfaced over the past three years. Earlier today, several of the cast members took part in a global Twitter Q&A session, where Harrison Ford seemed to reveal a massive SPOILER. You might want to stop reading now if you don't want to be spoiled, so consider yourself warned. The spoiler in question was revealed when Harrison Ford was asked by a fan what his favorite scene to film was in Star Wars: The Force Awakens. Before we reveal the spoiler itself, it's worth noting that the actor's statement seemingly confirms a rumor that sprouted up earlier this year, from a source that was reportedly present while this scene was shot at Pinewood Studios. 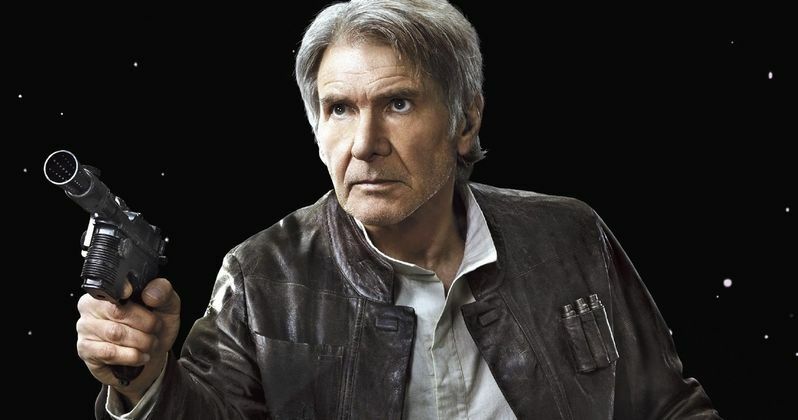 This is your absolute last chance to avoid any spoilers, so if you're still with us, take a look at what Harrison Ford had to say below, when asked what his favorite scene was in Star Wars: The Force Awakens. The sword fight with Rey and Kilo Ren. Fantastic visual storytelling." The original rumor, which surfaced in February, claimed that this scene takes place on the ramparts of "The Evil Castle," where Han Solo is hiding from Kylo Ren (Adam Driver). Han decides to reveal himself to this villain, which stops Finn (John Boyega), Rey (Daisy Ridley), Chewbacca (Anthony Daniels) and BB-8 in their tracks. Kylo Ren then kills Han Solo, causing Chewie to let out a series of roars while firing his blaster, as Kylo Ren makes his escape. Naturally, that rumor was never confirmed by Disney or LucasFilm, and while Harrison Ford doesn't confirm that Han Solo dies in his brief tweet, it's possible that this beloved character may die. However, the original rumor doesn't mention that Rey gets in a "sword fight" with Kylo, or even that Han and Kylo engage in battle. It only says that Kylo "silences the conversation forever," indicating that this villain kills Han Solo, especially since he is never seen again after this scene. It's worth noting that Harrison Ford himself has long said that he wanted George Lucas to kill off his character in Star Wars: Episode VI - Return of the Jedi, but that never happened. It seems the actor may have finally gotten his wish in Star Wars: The Force Awakens, but we'll have to wait until December 18 to find out for sure. Do you think that Han Solo may be killed in this highly-anticipated movie? Take a look at Harrison Ford's tweet from the official Star Wars Twitter account, and stay tuned for more on Star Wars: The Force Awakens.